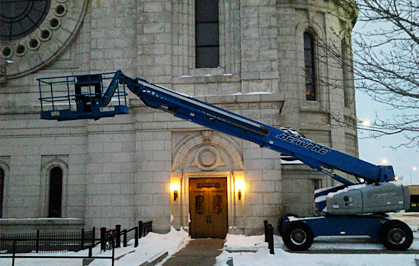 Every year The Basilica Landmark must make crucial repairs to the Church exterior granite stones’ mortar joints loosened by the freeze and thaw cycles. Tuck-pointing repairs the mortar joints to prevent moisture penetration to keep the interior dry and to stabilize the historic structure. 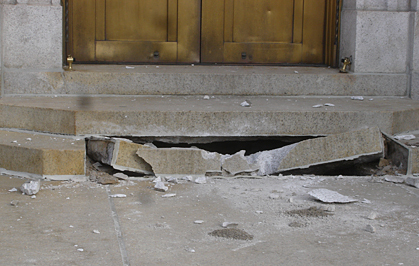 In 2011, 300-pound exterior dentil stone came loose from the Basilica’s West bell tower, falling from the façade and crushing the front steps. Engineers and other professionals assessed the Basilica's exterior and conducted sonar readings to determine the extent of the damage. 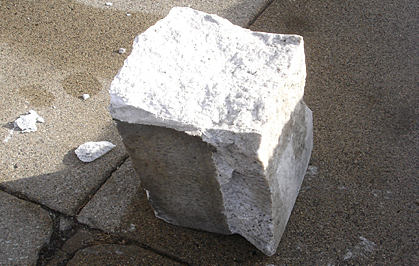 The engineers concluded that the fallen stone was caused by a crack that filled with water. 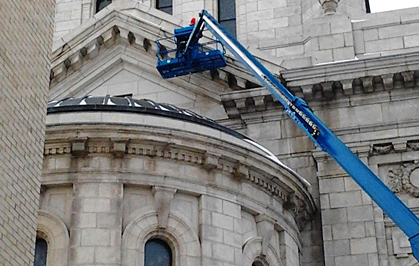 This incident illustrates the challenges faced in maintaining a 100 year old building and reinforces the need for The Basilica Landmark's ongoing preservation and restoration efforts.